On Wednesday 18 June, we took over Parliament. Okay, exaggeration aside, we brought prostate cancer to Parliament. Every year we organise an annual campaigns day at Westminster and Holyrood. It's a day for people affected by prostate cancer to speak to politicians about the issues that matter to them. Bringing politicians face-to-face with their constituents is one of the best ways of getting things on the radar. And nothing beats speaking to someone with personal experience of prostate cancer. This year in Westminster we decided to do something a bit different. Firstly, we launched a vision document called Men United: Five Inequalities, Five Solutions. This lays out the key inequalities in the support available for men with prostate cancer, and our solutions for tackling them. Amongst other asks for politicians on the day, we called for risk factors for prostate cancer to be included in public health programmes. This will help men know their risks and hopefully seek support early. Secondly, this year we brought a branded barbecue and burger van. We parked it opposite Parliament, and invited MPs and peers to join us for a free lunch and a chat. Not only did this offer a relaxed and fun atmosphere in which to have serious conversations, it also helped promote our exciting new Man v BBQ event, which you can find out about here. As always with an event like this, there were the last minute worries – will it rain and soak the burgers and MPs? No, it was glorious sunshine! Will the van get stuck in traffic? It did, but got there on time. And the unexpected – there were strong rumours on the day that there was going to be a protest march outside Parliament…but thankfully no marches appeared. 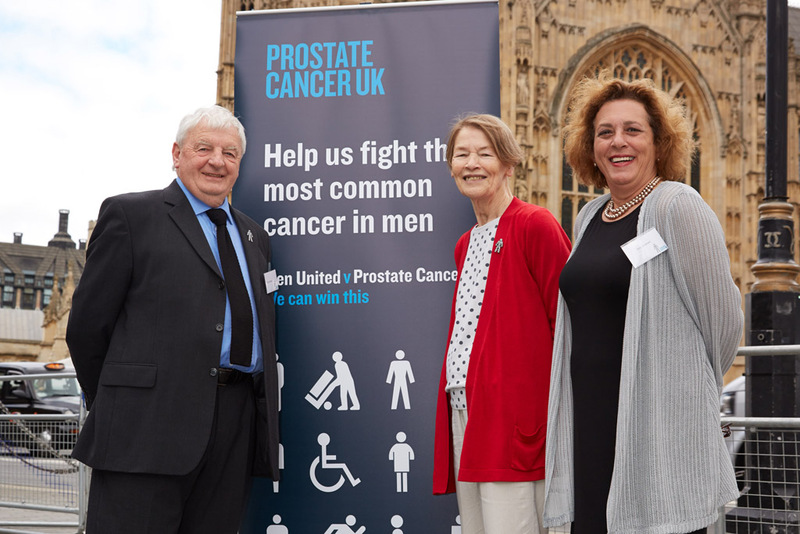 The day was a great success, and huge credit goes to the 31 Prostate Cancer UK supporter campaigners who did fantastic work in meeting politicians and getting the messages across on the day. 79 MPs and 5 Peers met with Prostate Cancer UK campaigners and staff. Among others, we met Andy Burnham, Shadow Secretary of State for Health; Paul Burstow and Andrew Lansley, both former health ministers; Baroness Royall; David Blunkett and Glenda Jackson. 11 MPs and 1 Peer also tweeted about us and our report (#MenUtd5Solutions) with one MP's researcher tweeting he was, "really impressed with @prostateUK lobby day. Important issue well communicated by constituents and professionally ran". Mark Durkan MP told us it was the most creative event he's been invited to in over 30 years as an MP. We're following up with everyone we met to make sure they keep their promises of support, so watch this space for updates. Roll on our Holyrood campaigns day in August, where we're hoping for similar success.